I never remember dreams, but last night I had one and I remember every little detail about it and will never forget it. Our baby girls came to me last night and today I smile. Last night I couldn't sleep, so I got up and came out to the living room. I started working on my shutterfly photobook for Emilyn and Hailey, up until this point I couldn't bring myself to do it, but I got several pages done and they're perfect. Anyway, I wanted to include the meanings of their names so I looked them up. Emilyn's name is a form of Emmalynn, which is Emma and Lynn combined. One of the meanings of Lynn is waterfall. Emma means one who is complete. Hailey is a form of Hayleigh which means meadow of hay. I finally got tired so I went to sleep and last night I dreamed of getting a tattoo. This isn't something abnormal even though I don't have one yet, I planned on getting one on our vacation to Hawaii. But what I dreamed about getting is different than what I was planning on getting. 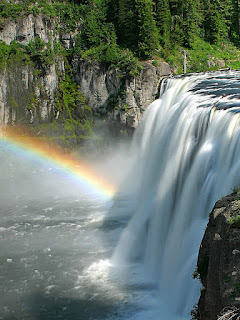 I dreamed about getting a tattoo of a waterfall, but not a blue waterfall, one that is all the colors of the rainbow. So I picked it out, and told the guy that was what I wanted. He wasn't the tattoo artist but he was getting it ready for her, she was on her way in. He traced it and put the drawing on me to transfer the outline. It was kind of weird becasue it was like he was putting an artificial tattoo on me now that I think of it but not the stick on one. I remember him taking the tattoo gun or whatever you call it and putting all the color in, but it didn't hurt. When he was done I didn't like what he did, it was in the wrong place. He used tape to pull something up, and I yanked it up from one side because I wanted it changed. Just as I did that Amy walked in the door and he was upset he didn't have it fully done. Oh, and I also remember he tried to trace some words on my arm to tattoo, but they were big and bold and I didn't like those either, don't remember what they said though. Amy is the name of the lady I have an appointment with in Hawaii to do my tattoo that I want. So Amy came in, and I got up and went to the bathroom while she prepared everything to do the tattoo. When I sat down I noticed that there was a huge spider in the corner on a web and a little butterfly fluttering around. I watched both. There was also a sign in front of the spider that said "Do Not Kill, Everything Has A Part In This World". The butterfly hit the web and of course got tangled. The spider went over to the butterfly and started trying to tear at it, but to no avail. I watched in horror as the spider then cut open the butterflies neck but couldn't take my eyes away. To add to my horror, I realized that it wasn't a butterfly but a little girl in a butterfly costume and the spider had all but killed her. 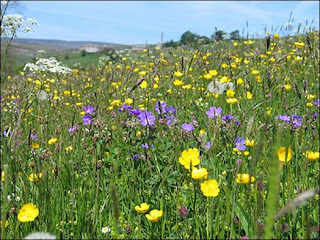 The next thing I remember is the butterfly girl going over to a meadow of hay and flowers, laying down and dying. I went back out to the tattoo room shaken, and somehow knew that the butterfly girl was Amy's little sister and was afraid to tell her of her sisters death. I gathered up my courage as she started tattooing me and told her of her sisters death. She had no reaction. The other guy that did the first tattoo went into the bathroom to see, and came back and confirmed that Amy's sister was in fact dead. Still no reaction, she didn't say it but I knew what she was thinking, she was thinking that her sister was better off. She had been sick all her life, and was better off in heaven and not suffering anymore than living in this earthly world. Instead of breaking down, she continued on with my waterfall tattoo and it was the most beautiful thing I had ever seen. So both of my girls came to me in my dreams last night. Emilyn with her waterfall tattoo, and Hailey with her meadow of hay and flowers for the dying butterfly girl. My heart is lighter today than it has been since I lost Emilyn and Hailey, I am so glad they came to me finally last night. After I left my house, I decided that Hailey has a sense of humor as well. I walked outside, and saw a little yellow piece of paper tucked behind our mailbox (it's attached to our wall). Opened it up, and we had gotten a ticket for not mowing our lawn! I walked out and looked at our lawn to see how bad it really was. I swear it wasn't that bad just yesterday, we would have mowed it if it was. It's like it grew overnight! It literally looked like a meadow of hay in our front yard it was so high! I had to laugh, thank you Hailey! Thank you Emilyn and Hailey for coming to me in my dreams, it makes my heart lighter and puts a smile on my face. Mommy loves you both so much! Love how our angels find us!